Part of the liquid air plant at Ilkeston Rescue Station. All men had to know how to operate this machine. It ran for at least 8 hours. 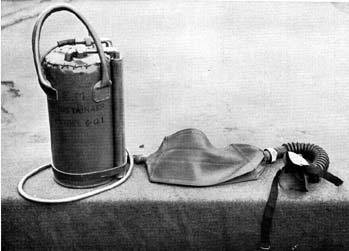 The breathing apparatus used liquid air. It was -186C below freezing. Made by Hoekes of Holland. 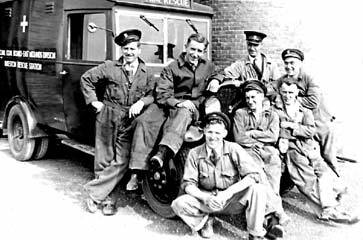 Benny, seen here, second from left, came from Hoekes of Holland to install the equipment. While over in this country he stayed with Shef and his family. While explaining about the liquid air, to miners, Shef used to drop a rose into it before hitting it with a hammer. The smashed rose, on the floor never ceased to amaze his audience. Les Havill's note book shows the amount of maintenance required to keep this unit working. The use of liquid air and compressed oxygen in mine rescue work was very important. By virtue of their application in this field, the production of low temperatures is of interest to the student of mining technology, and the rescue worker. The earliest attempts at the liquefaction of the so-called permanent gases involved the conception of a critical temperature. Any gas having a temperature lower than its critical temperature, can be liquefied by the application of pressure. Carbon dioxide has a critical temperature of 31.1 °C. At temperatures higher than this it cannot be liquefied by pressure. The critical temperatures of oxygen and nitrogen are minus 118°C and minus l46°C respectively. The commercial method of making liquid air, from which oxygen was obtained by a process of rectification involved the conception of an inversion temperature, which was much higher than the critical temperature. A gas, existing at a temperature below its inversion temperature, cooled on being allowed to expand through a porous membrane or a small orifice. 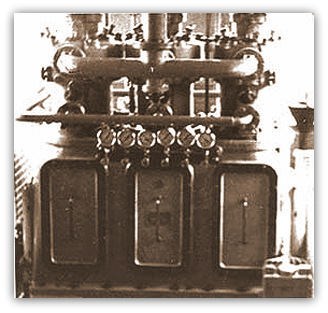 This latter method of producing cooling, to a degree sufficient to bring about liquefaction, was developed from the researches of Linde, Joule, Thompson, Hampson, Dewar and others. Oxygen, nitrogen, hydrogen and helium, the latter boiling at a temperature of minus 272°C, were liquefied by the expansion method. In the case of air, it was first compressed to a pressure of about 3,000 pounds per square inch, freed from carbon dioxide and water vapour, and then cooled by a combination of expansion and heat interchange, generally using the Hampson spiral coil method. A portion of the compressed air was allowed to do work against the piston of an air motor. On its being exhausted this cooled air was utilised to extract heat from the portion to be expanded at an expansion orifice. When the unexpanded portion attains a temperature below its inversion temperature, it suffered a further drop in temperature at an expansion valve orifice, and was itself utilised for further cooling by reverse flow in the Hampson spiral. This cycle was continued until eventually the air arriving at the expansion orifice was sufficiently cooled to effect liquefaction on its passing that Orifice. The required oxygen content of the liquid air is fixed by a process of rectification. This also determined the oxygen content of the gaseous air obtained by evaporation from liquid air. 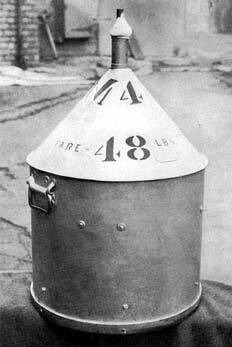 For use in the compressed oxygen types of self-contained breathing apparatus, reviving apparatus, and medical work, gaseous oxygen was manufactured having a purity of not less than 98%. Liquid air is pale blue in colour, this being due to the blue colour of liquid oxygen. It has a temperature of approximately minus l96°C. When consisting of a mixture of 50% oxygen and 50% nitrogen, at its boiling point, it has a density compared with water of about 0.9. One litre of this liquid gives about 725 litres of gaseous air at 0°C., and 778 litres at 20°C. One pound of liquid air gives about 12.5 cubic feet of gas at 20C. The gaseous air, evaporating from liquid air containing 50% of oxygen, has an oxygen content of about 22%. Because of the very low temperature, latent heat of vapourisation and specific heat, liquid air can be stored only in very highly evacuated flasks, constructed on the principle of the ordinary thermos flask, so that heat cannot be transferred readily to the contents. A vacuum flask is a double walled vessel, the space between them being highly evacuated. This reduces the passage of heat by convection. The walls are highly polished to reflect heat which might be passed by radiation and contact of the walls is reduced to the minimum to prevent conduction. For the storage of liquid air, Sir James Dewar produced a vacuum flask made of spun copper, and which is now used generally for this purpose. In mine rescue work flasks having a capacity of about 25 litres are used both for storage and transport. This consists of an inner and outer vessel, both made of spun copper, in contact with each other only at the neck joint. The air space between them is highly evacuated by means of an air pump such as the reciprocating Gerryck, or the rotary Cenco Hyvac. These pumps are capable of reducing the air pressure to the order of l0-3 m.m. of mercury. Sir James Dewar found that activated coconut charcoal at the temperature of liquid air was able to absorb both oxygen and nitrogen, and made use of this fact to further improve the efficiency of the vacuum space by incorporating in it a quantity of charcoal in direct contact with the base of the inner vessel. In this way the pressure in the vacuum space is reduced to the order of l0-7 m.m. of mercury. The outer surface of the inner vessel, and the inner surface of the outer vessel are highly polished by a buffing process. An efficient flask loses about 2.1/2% of the weight of its contents every 24 hours. This small amount of evaporation is caused mainly by the direct conduction of atmospheric heat along the neck of the inner vessel, from the point of contact with the outer one. This brings about an increase of the oxygen percentage of the liquid air contained. It is from these vessels that liquid air is poured direct into the pack of the liquid air types of self-contained breathing apparatus. To facilitate transport the flasks are mounted in special carrying frames. Compressed Oxygen types : The General Regulations (Rescue) 1928, require oxygen to be kept available for resuscitation at both collieries and central rescue stations. The apparatus consists of carbon steel cylinders having a capacity of 280-420-560 litres of pure oxygen, fitted with a main valve to control the flow from the cylinder. An attachment to the cylinder main union carries a pressure gauge, control valve, breathing bag of 6-7 litres capacity, oxygen supply tube and an orinasal mask. The latter is fitted with inhalation, exhalation and fresh air valves. To use the apparatus the oxygen supply is turned on, the bag inflated and the ori-nasal mask fitted in position whence it is held by an elastic band passed round the back of the patient's head. Alternatively, the ori-nasal mask is fitted with the fresh air valve open, the oxygen is turned on and then the fresh air valve is closed. A cylinder of 280 litres capacity will last for about 20-30 minutes dependant on the skill of the person operating the machine. An apparatus making use of oxygenated air evaporated from liquid air was produced in the East Midlands Division of the National Coal Board around 1955. This consisted of a liquid air evaporator which took a charge of 5.1/2 - 6 pounds of liquid air. The evaporating air passed through a warming device to a breathing bag of 5 litres capacity from which the air flowed through a corrugated rubber breathing tube to an ori-nasal mask fitted with an automatic pressure relief valve set to operate at 0.4 inches of water gauge. The apparatus gave a minimum feed of 8 litres of oxygenated air two hours after charging. 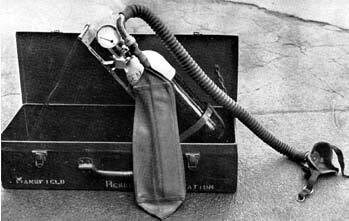 The primary use of this apparatus was to give the earliest possible protection to asphyxiated persons whilst they were awaiting removal from an irrespirable atmosphere to the advance base in fresh air. This apparatus had been worn by a normal person lying down for a total period of three hours, at the end of this time the air flow would have been 5.6 litres per minute with an oxygen content of 92%.